Looking out for some cool iOS 7 text editing jailbreak tweak? We might just have something hidden for you! 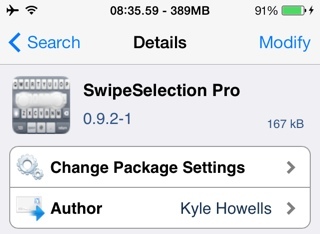 SwipeSelection is a popular text editing jailbreak tweak available for free on Cydia. This iOS 7 text editing tweak lets you edit text using gestures. If you intend to go for the packed version full with features, you can also purchase the SwipeSelection Pro available on Cydia for $1.99. Now completely compatible with iOS and supporting 64 bit A7 chips like iPhone 5s and Retina iPad Mini, SwipeSelection Pro is the ultimate go-to text editing tweak. Get the tweak from Cydia, install it and then simple swipe on your iDevice’s virtual keyboard to start editing text. Go to Settings > SwipeSelection to enable / disable any features. It allows you to adjust the sensitivity based on your preference. Reduced sensitivity means it is less sensitive, which means the deadzone before SwipeSelection activates is bigger. This will prevent accidental activation of SwipeSelection while typing fast. It also allows you to adjust the swipe speed, which is essentially the speed of the insertion point when you swipe on the keyboard. You can also change the swipe area to either the whole keyboard (which is the default), or Everything but the space bar or just the space bar. You can also enable a toggle so that you can enable or disable SwipeSelection by triple tapping the shift key. You can use three finger swipe to move the insertion point to the beginning or end of a document, though Howells recommends enabling this on the iPad. It adds support for right to left languages.